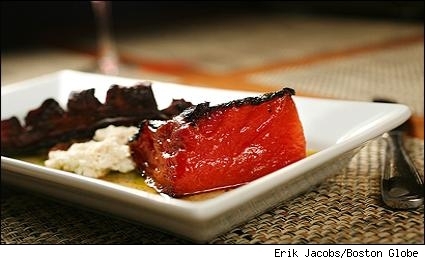 RECIPE: WATERMELON STEAK - What About Watermelon? Recently, a friend sent me an e-mail with a subject line that read simply “thought you’d like this!” The body of the e-mail was a link – nothing else. I clicked on the link and what greeted me on the other side was a curious culinary concoction known as the watermelon steak. The watermelon steak is a simple thing – a slice of watermelon (without rind) pan-seared in sherry, butter, salt and pepper. It’s a big hit at a restaurant outside Boston called 51 Lincoln. At 51 Lincoln, Chef Jeffrey Fournier serves it as a $10 appetizer alongside feta cheese and a cantaloupe and citrus salad. I haven’t eaten at 51 Lincoln, but if I find myself in that neck of the woods anytime soon (unfortunately, I won’t), I’ll make it a point to stop in to sample Chef Fournier’s handiwork. Below is the recipe for watermelon steak. According to the Boston Globe website where I found it, the recipe is “adapted from” 51 Lincoln. I don’t know whether that means it’s the exact recipe, but it looks close. Not that I’d know what a watermelon steak recipe should look like, although I am alarmed that the watermelon has to roast in a pan for two-and-a-half hours at 350 degrees. That seems like a long time, but what do I know? 1. Set the oven at 350 degrees. Have a large roasting pan on hand. Oil a piece of parchment paper about the size of the pan. 2. Discard the rounded end of the watermelon. Cut the watermelon into 4 even slices, each at least 1-inch thick. Remove the rind. 3. Place the slices in the roasting pan. Pour the sherry over them and dot with butter. Sprinkle with salt and very lightly with pepper. Cover the watermelon with the parchment paper, then cover the pan tightly with foil. Roast the slices for 2 1/2 hours or until charred around the edges. 4. Place watermelon on a rimmed baking sheet to cool. Strain cooking juices. Serve watermelon with juices spooned over, and feta cheese.